Offering their welcome here are Orient residents, back left: Alvin Martinmaas, Bob Hansen, Bill Muth, Max Martinmaas, Bill Martinmaas, Joe Pfeifer, Kyle Wangsness, Gary Remmers, Kathy Remmers, Steve Schulte, Skyla Wangsness, Larry Wangsness, Ray Pottebaum, John Hagen and Sam Aesoph. Center left: Cindy Martinmaas, Darci Martinmaas, Amanda Wangsness, Delores Eaton, Abby Clement, Helen McKay, Courtney Edgar, Marlene Wangsness, Beth Edgar, Dean Edgar, Delores Clement, Alex Aesoph, Kelly Aesoph, Anna Aesoph, Otho Eaton, Don Clement and Jody Clement. Orient is planning a big welcome for a 125th anniversary of the founding of the town. 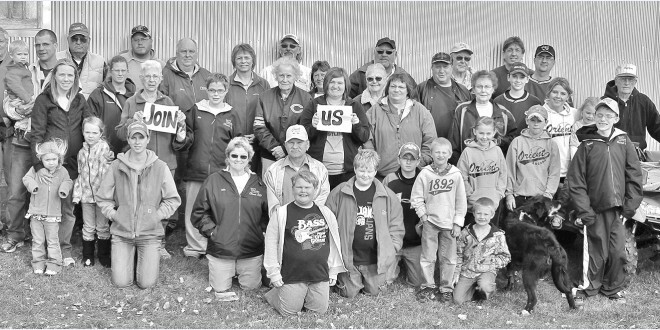 Recently a good portion of the town population (63, according to the 2010 Census) gathered for this photo and to invite everyone to “Come Join Us” Friday through Sunday, July 6-7-8, for the Orient Quaquicentennial Celebration. Thanks to the Faulk County Record for providing this story. Do you have a quasquicentennial celebration or all-school reunion coming up? Let us know and we’ll feature your celebration too! Please comment below.